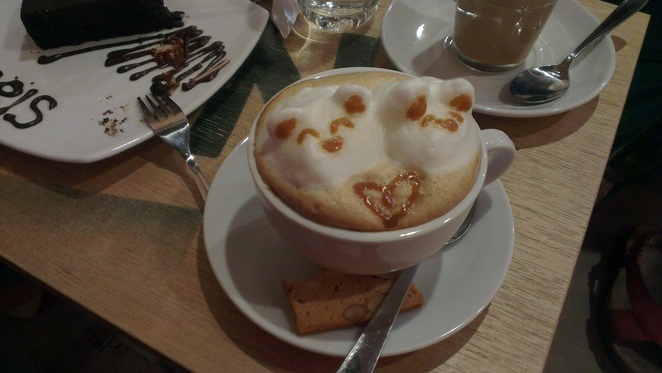 Nowadays, cafes are so commonplace that it becomes difficult to distinguish the good cafes from the really good cafes. 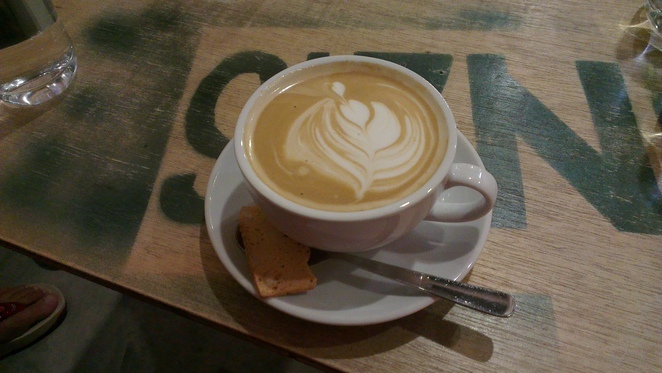 On that note, what if I told you there's a cafe that gives back to the community? Before I get to that, a standard review of NOIS. Location choice got me curious, as you will not find this in the heart of town. Instead, it is located near Penang Island's biggest university campus. And if it wasn't for Brian (a friend who wished to be named after being made anonymous previously), I would not have given this place a second look either. It quickly became clear why Brian likes this place so much. 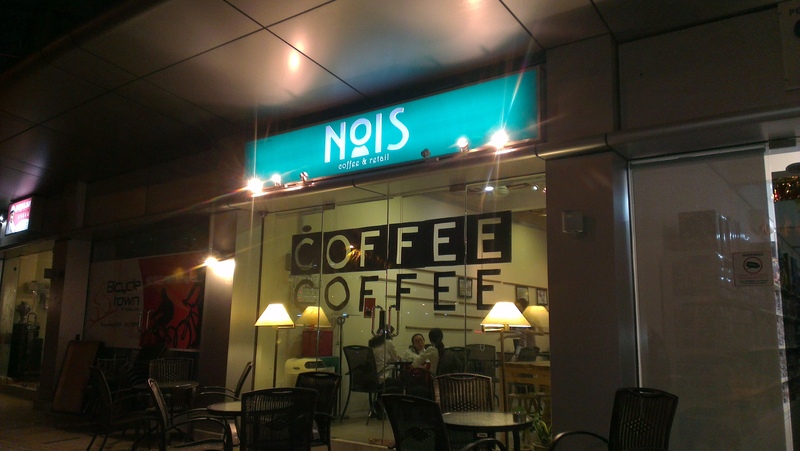 Occasionally, NOIS comes up with a decent offer for its customers. 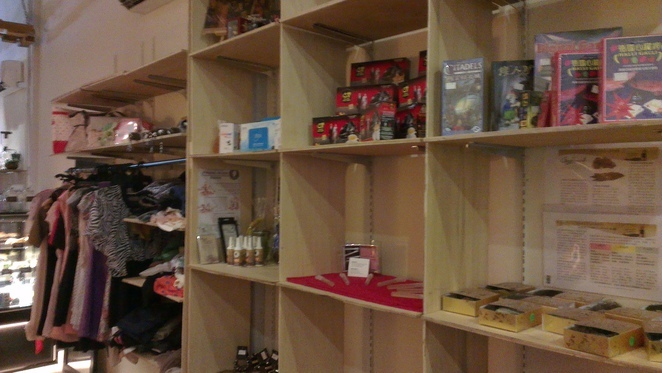 For instance, the first 5 orders at the start of every hour get a 50% discount. Now, it's a "buy 1-free 1" deal, more encouragement to bring company. 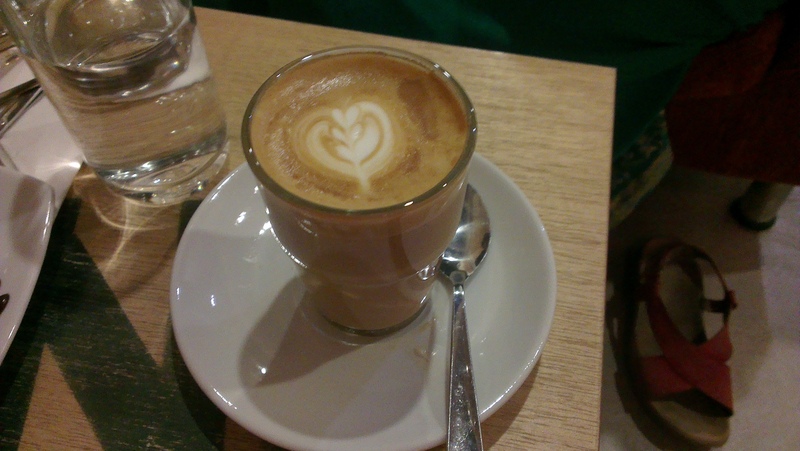 On my most recent trip with friends, Kelly's vanilla latte was nice and smooth, with a vanilla hint preceding a latte finish. Jaya had a standard latte, which would suit those who like some bitter in their lattes. Always the most expressive, Brian had a vanilla latte with an espresso shot, topped off with 3D coffee art, courtesy of the resident barista, Carina. 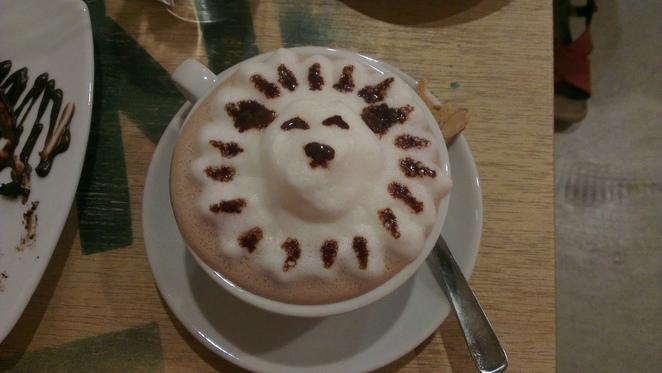 For those who like artistry in their coffee, Carina's work will not disappoint. Ironically, this cafe reviewer went for frothed chocolate milk, with roasted hazelnut flavoured syrup, and some adorable 3D art to boot. There was a sweet tang to it, which suits my sweet tooth just fine. Another highlight was the bouncy mud cake, which was creamy, soft, sweet and warm, one I would recommend to newcomers. Now, back to my earlier teaser. As founder and owner Aaron Loo puts it, NOIS stands for Navigating Opportunities In Society. 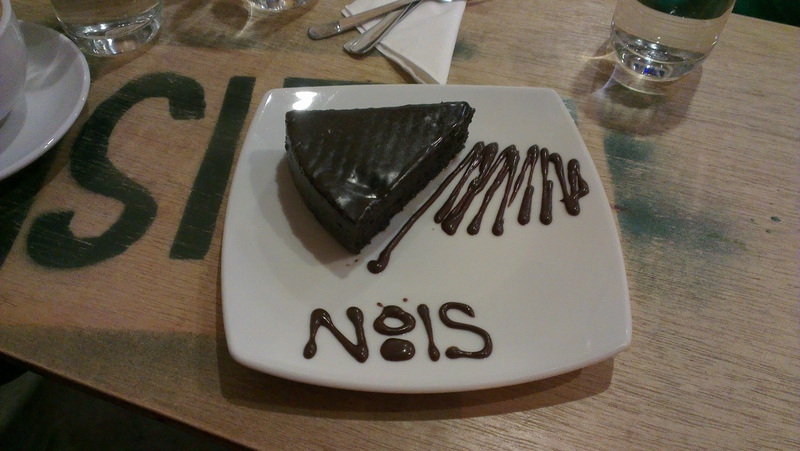 Other than being a standard cafe, NOIS gives a chance for outsiders to sell other products, such as clothes, accessories, and even cakes, with the bouncy mud cake one such example. As a young entrepreneur himself, it is endearing to see him finding avenues for other entrepreneurs to establish themselves. As well as being an entrepreneur, Aaron has a passion for education. So much so that he intends to generate enough revenue from NOIS to provide free tuition classes for students who can't afford tuition otherwise. This is his answer to the flaws in Malaysia's education system, where the less fortunate easily fall through the cracks. As it stands, one year on since he started, it is clear some planning needs to be done, but he is optimistic he can carry out this noble long term goal for NOIS as early as next month. 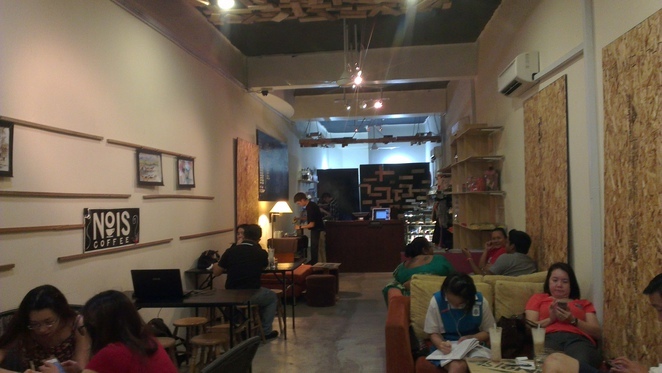 Final word on this place: good ambience, pleasant drinks and treats, great place to hangout, and a noble cause. Time to make some NOIS next time you're in this part of town. What a marvellous concept. Very unique, and very worthwhile.